A federal judge will allow a transgender woman to proceed with an employment discrimination lawsuit under the Americans with Disabilities Act (ADA), ruling that, while gender identity is not covered by the ADA, gender dysphoria is. 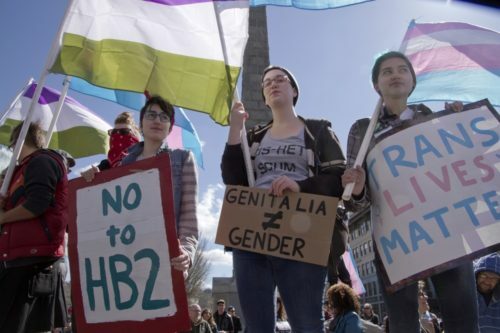 “This decision is consistent with contemporary medical standards, and is a huge step forward for the transgender community,” said Jennifer Levi, the Transgender Rights Project Director at GLAD. Kate Lynn Blatt worked at the retail chain Cabela’s in 2006 and 2007 in Hamburg, Pennsylvania, where she says she endured harassment, was not allowed to use the women’s bathroom, and was forced to wear a name tag with the first name given to her at birth. In her lawsuit filed in 2014, she claims that she was fired after false accusations were made against her. Judge Joseph Leeson did not rule on the facts of the case. Cabela’s filed a motion to dismiss Blatt’s claim, arguing that gender identity is excluded from the ADA. So Leeson was only looking at the question of whether the ADA prohibits the discrimination that Blatt says she faced. In his ruling, Leeson said that he would not address the constitutionality of the ADA for excluding transgender people because he believes that there is a broad interpretation of the ADA that avoids the constitutional question. This statement contrasts the popular – and politicized – description of what judges should do when they interpret law. There’s an idea, often expressed when Supreme Court Justices are going through Senate confirmation, that judges should be like baseball umpires and just interpret the law as written. Of course, if the law was written in a way that there was only one way to interpret it, then we wouldn’t need a judiciary to interpret the law. Judges rule on the meaning of laws when there are many reasonable interpretations, and they have various rules for choosing which interpretation is best. Gender dysphoria is a condition with symptoms like anxiety, depression, and social isolation, so Leeson concludes that it should definitely be covered by the stated purpose of the ADA. Leeson divides the excluded conditions into two categories: “non-disabling conditions that concern sexual orientation or identity” and “disabling conditions that are associated with harmful or illegal conduct.” Gender dysphoria would be “anomalous” on the list of excluded disorders since it is disabling by definition and because it’s not directly harmful to others or illegal. In this case, Leeson wrote that he is required to take the broadest interpretation of the ADA that he can, while narrowly interpreting the exceptions so that the law can achieve its broad goal. But how do we know that Blatt was discriminated against because she had gender dysphoria and not because she was transgender? Cabela’s, the company that’s being sued, argued that even if Blatt is right about everything, she is still saying that she was discriminated against for being transgender. Leeson responded, though, that when Blatt asked to use the women’s bathroom and to have a name tag with her correct first name on it, it’s possible to interpret that as her asking for accommodations for a disability, since those measures would have reduced the anxiety and social isolation associated with gender dysphoria. After asking for those things, Blatt says that she was retaliated against. Therefore, it’s possible to interpret the facts as a pure disability discrimination claim, and the judge’s role here isn’t to rule on what the facts are, just on what the law says.